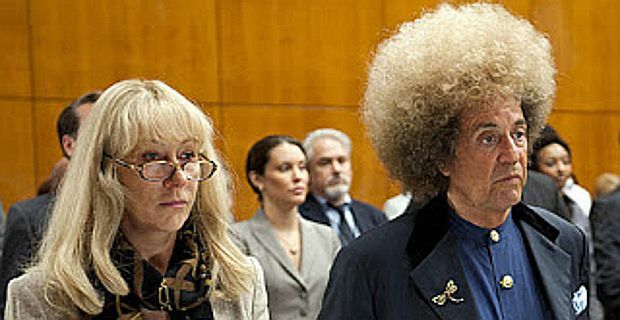 Al Pacino’s method acting technique will face one of its sternest tests when he plays producer Phil Spector in HBO’s biopic of the homicidal legend. Judging from the trailer and stills released so far, Pacino seems to be placing a great deal of emphasis on hairstyle acting. The brief clip shows Pacino chewing up the scenery in a characteristically over-the-top performance, aided and abetted by Helen Mirren smouldering and brooding as his defence attorney Linda Kenney Baden as he goes on trial for the murder of actress Lana Clarkson. The writer is prestigious dramatist David Mamet, but the trailer suggests the script is pure Hollywood kitsch. Pacino as Spector snarls at Mirren, his lawyer with the mid-Atlantic accent: "First time you got felt, up, guess what, you were listening to one of my songs." Another character predicts: "They let OJ go, they let Michael Jackson go, they are not going to let him go," as if told to come up with a one-liner that could go on the advertising blurb. The film has had a troubled journey to screen. Bette Midler was originally lined up to play Pacino’s lawyer but withdrew due to health problems. Persistent rumours suggested that Mamet was taking a sympathetic line towards Spector. This did no go down too well with friends and family of his victim. Rather than trying to ensure the film offered a respectful portrayal of events though, they preferred to try to damage its chances of winning any awards. A PR executive who claims to have dated Clarkson said: "We intend to put a campaign on with the Academy members to make sure there are no Emmy nominations for a motion picture that's a lie and hurts people who are alive today." Only in Hollywood. Going by the trailer, it would seem that awards nominations are probably unlikely anyway. Spector is currently serving 19 years to life in a California prison for the 2003 murder. It might be best if the authorities deny his TV privileges on transmisson night, March 24.